UAE– Dibba Al Hisn - An archaeological dig on an ancient settlement in Dibba Al Hisn has not progressed for a year, as authorities continue to negotiate the purchase of surrounding buildings. 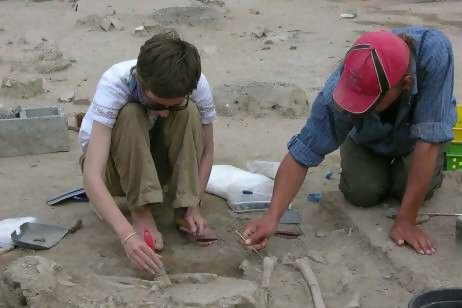 Excavation of the site has been restricted to an area of 20 metres by 20 metres, where a settlement believed to be more than 2,000 years old had been found in the Sharjah enclave. But work was halted midway through last year as Sharjah officials tried to buy the properties. Archaeological work in Dibba Al Hisn began in 2004 when a resident found a piece of pottery in his garden. 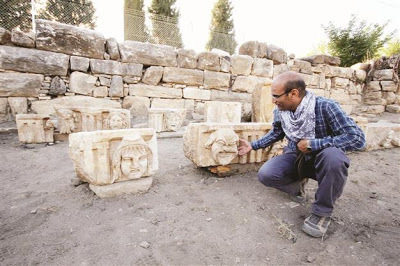 Authorities bought the property and later found a large tomb dating from the first century AD, with items that suggest trade with the Roman and Mesopotamian empires. Dibba Al Hisn, on the east coast of the country, was once the capital of Oman and an important port for the region. 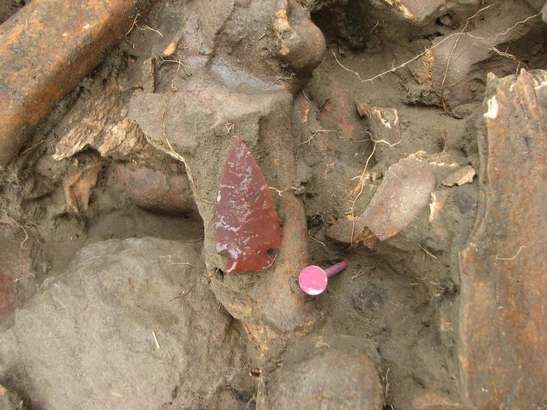 The settlement is the second site to be investigated in the area, and archaeologists have already found artefacts dating to the 1st or 2nd century BC. GRECE – Polichrono - One of the rarest sundials dating from the Greco-Roman period was found in Polichrono in Chalkidiki.This sundial is not a usual one as it shows the correct time at any given place. It is noteworthy that in the Ancient Greek world, sundials consisted of a gnomon (indicator in Ancient Greek) in the form of a vertical post or peg set in a flat surface, upon which the shadow of the gnomon served to indicate the time. This sundial has a surface which is separated in 12 parts representing 12 hours of the day. More particularly, the sundial consists of a hyperbola tracing the shadow’s path at the winter solstice, a second one for the summer solstice, and a straight east-west line in between marking the equinoctial shadows. A line from the base of the gnomon to the south of the dial running due north denotes noontime. The hyperbola is centered on this noon line. The winter hyperbola opens to the north, the summer hyperbola to the south. In addition to the center noon line, additional oblique lines are added on either side to denote the hours of daylight before and after noon. Archaeologist of the 16th Ephorate of Prehistoric and Classical Antiquities, Betina Tsigarida, specialist in the area of Chalkidiki, was the one to find the sundial and was given it as a reward for her work. ITALIE – Alban hills - Investigations into the activities of four tomb raiders in the Alban hills near Rome have led to the discovery of a previously unknown site containing ancient Roman votive offerings. The ex-votos date from the fourth to the second century BC and include life-sized statues and depictions of parts of the human anatomy in terracotta offered to the ancient Roman goddess Juno. Police caught the tomb robbers in action as they were stealing the devotional objects from a natural cavity in a tufa wall near Lanuvio and Genzano that did not appear on archaeological maps of the area. The cavity appears to be linked to a nearby sanctuary dedicated to Juno the Saviour via a network of caverns and tunnels. The discovery is considered important as it testifies to the existence of a workshop once producing prestigious terracotta objects in the area. Investigators believe the stolen ex-votos were destined for the international collectors' market. Police found other ancient artefacts including sepulchral items mostly dating to the Etruscan era during their search of the tomb raiders' homes. ROYAUME UNI – Arbeia Roman Fort - Volunteer diggers have unearthed a series of key finds at Arbeia Roman Fort in South Shields. 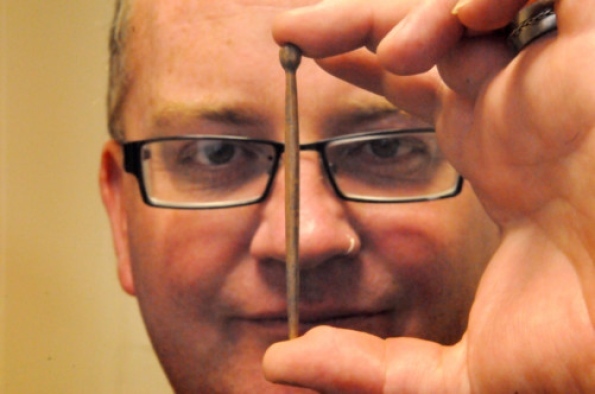 The latest discovery – a Roman hairpin made from animal bone – was made when amateur archaeologists from Newcastle. Nick Hodgson, archaeological projects manager, said: “Arbeia is the only fort on Hadrian’s Wall where visitors can see archaeological excavations taking place and take part.“These recent finds show that there are still exciting finds to be unearthed here. The volunteers also cleaned and sorted artefacts previously found on the site, including pieces of Roman pottery, animal bones and Roman brick and tiles. The animal bones included pieces of a dog’s jawbone – part of two third-century dog burials found at Arbeia in August. They were possibly buried for ritual reasons. 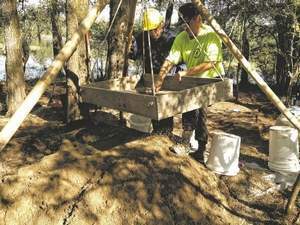 USA – Widdish Island - Daniel Cain, zone archaeologist with the U.S. Forest Service, was one of the leaders of the group at the Drake Salt Works Site near Saline Bayou. "There's just a whisper of human presence here about 4,000 years ago," Cain said. The presence is much heavier for the last thousand years as agricultural technology evolved, he said.Members of the Caddo Indian Tribe lived and worked on the site to produce salt. As settlers came to the area, salt was sold to the French and Spanish, especially as nearby Natchitoches was founded, Cain said. After the Caddo left the area, a local man named Drake took over and gave it his name. But the Civil War later became the main driver of the industry. The site is on a small island that was flooded just last week with the rain, pushing the volunteers a little further inland. They've named the site Widdish Island, using the Caddo word for salt. ITALIE – Rome - Rome may not exactly be short of catacombs, but one discovered this week is more deserving of the name than the city's countless other subterranean burial chambers. For Mirko Curti stumbled into a 2,000-year-old tomb piled with bones while chasing a wayward moggy yards from his apartment building. Curti and a friend were following the cat at 10pm on Tuesday when it scampered towards a low tufa rock cliff close to his home near Via di Pietralata in a residential area of the city. Inside the small opening in the cliff the two men found themselves surrounded by niches dug into the rock similar to those used by the Romans to hold funeral urns, while what appeared to be human bones littered the floor. 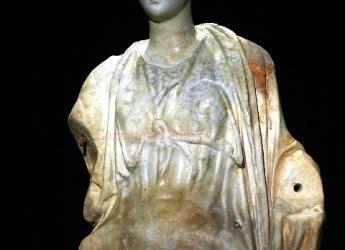 Archaeologists called to the scene said the tomb probably dated from between the 1st century BC and the 2nd century AD. Given that niches were used to store ashes in urns, the bones had probably tumbled into the tomb from a separate burial space higher up inside the cliff. Heavy rains at the start of the week had probably caused rocks concealing the entrance to the tomb to crumble, they added. USA – Sarpy Creek Bison Kill site - A team of archaeological investigators, anthropologists and Crow tribal officials today are headed to the site of a 2,000-year-old bison kill site that was unearthed last summer as part of Westmoreland Resources Inc.’s plans to expand its Absaloka Coal Mine. The site, known as the Sarpy Creek Bison Kill site, was first discovered during a resource identification effort required under the National Historic Preservation Act for the company to expand the mine. The largest bison bone bed was estimated to cover almost 3,000 square meters and contained the remains of hundreds, perhaps thousands, of butchered bison remains and prehistoric spear points dating back to the Late Archaic period, Utah State University anthropologist Judson Finley said. 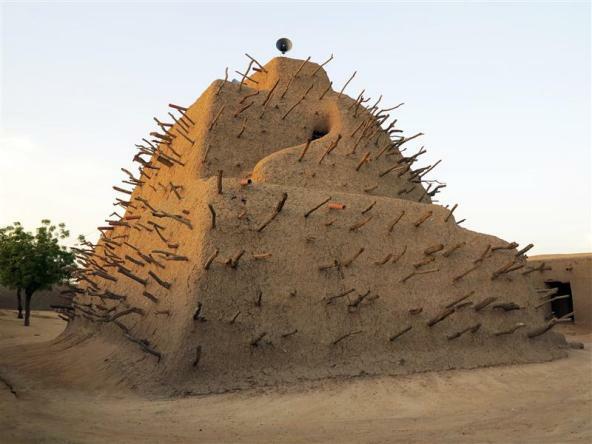 MALI – Tombouctou - Heavily armed Islamists bulldozed the tombs of three local Sufi saints near Mali’s desert city of Timbuktu on Thursday, residents said, the latest in a series of attacks in the rebel-held north that critics say threaten its cultural heritage. Residents said the tombs destroyed included those of local saints Cheick Nouh, Cheick Ousmane el Kabir, and Cheick Mohamed Foulani Macina, several kilometers (miles) outside of the city gates.